The bridal shower cake is one of the highlights of the party. Your guests, especially the "guest of honor", will remember how it looks. Not just an ordinary dessert, it is often used as a centerpiece on the main table, or the focal point of a side table. Bridal shower cakes usually coordinate with the decorations. Picture the look you'd like. Using colors and designs that go along with your theme, will help in your decision. Will it look soft and romantic, or strong and vibrant? Will it have a casual or elegant feel? 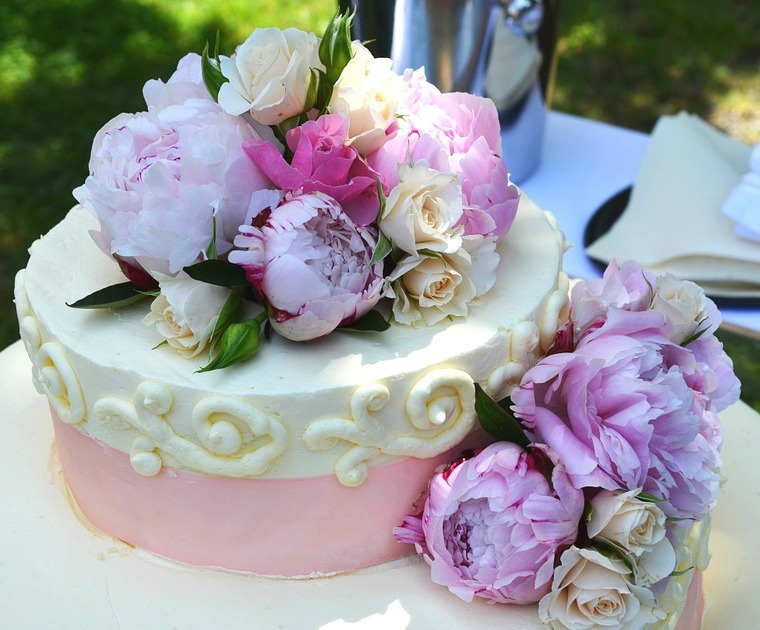 *** Have a favorite bridal shower cake idea? Share it! Keep in mind the "guest of honor's" taste. Consider what flavor and/or type of cake she would like. Be aware of any special dietary needs she has. • Type: sheet cake, or round. • Will it be more than one layer? • Flavor: vanilla, chocolate, lemon, etc. • Filling: fruit,icing, cream or custard. • Icing: butter cream, chocolate, cream cheese, etc. • Type of design you'd like. If you're not sure, ask at the store. Their designers can offer numerous suggestions. • Individual two tier mini cakes will be the hit of your party. Start by choosing a vanilla or chocolate cake. Pick a design and icing color to complement your decor. 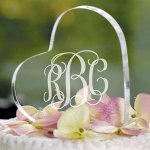 Then personalize with a monogram or text for a total custom look. 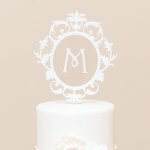 • The bridal shower picture cake is a very unique idea. You provide the bakery with a photo. This picture is then transferred on, as the top layer of icing. Ideas that can be used are: pictures of the couple, family, or friends. This is a great bridal shower idea. Are you or someone you know, skilled in baking and decorating? Perhaps someone has offered to make one. A homemade recipe can be a memorable token for the bride to be. There are also many delicious mixes. Look on the box, itself, or in your favorite cookbook. • Is there a color scheme to follow? • What is the party theme? You may want the dessert decorated to go along with the theme. • If you need to transport your bridal shower cake, make sure to use a board, or other means of support. • A decorating kit can be used to achieve very professional results. 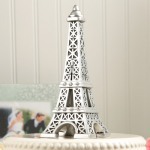 Found at craft stores and online, they make decorating with different designs a breeze. • Cake sparkles are edible glitter, sold in a variety of colors. Sprinkle on your finished cake and cake plate for a special glow. • Have you thought about adding some jewelry? This is a great way to personalize your dessert. • Sayings or inscriptions can be funny or serious, and help reinforce your party ideas. • What about cupcakes? These are a great alternative. They can be simple and sleek, or ornate showpieces. • A cake plate often forgotten, this can enhance your choice. • Dessert decorating ideas...decisions! decisions! decisions! • Bridal shower cookies...a cute choice with so many options. • Need other types of dessert ideas? What if you don't want cake? • How about a candy buffet? This is a sweet addition to any party. If you are having the party at a restaurant, you may have the choice of using their dessert, or providing your own. Either is appropriate. Sometimes your budget may enter into this. You may want to provide this special item on your own, if you are planning on a bridal shower picture cake. ***Your bridal shower cake idea will add to her memories. Remember to take a picture! Have A Great Bridal Shower Cake Idea? 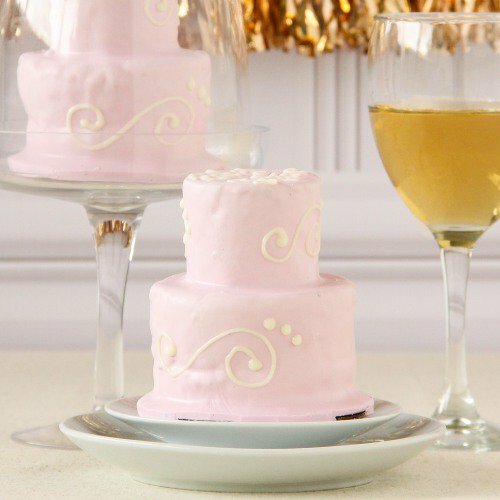 Do you have a bridal shower cake idea that everyone was talking about? Tell us about it. Did it go along with a theme? A picture of the cake (if you have one) would be appreciated, and helpful to others. It's easy to do, just follow the directions below. Please give your cake idea a title. Do you have a picture of your cake to add? Great! Click the button and find it on your computer. Then select it. Have the design on the shower invitation put on the bridal shower cake. It ties in your theme and is very unique!